The journal publishes articles in sphere of philosophy, political science and law. where the main scientific results must be published to receive scientific degrees of doctor and candidate. Since 2006 the journal is included in the Russian Science Citiation Index. Impact-factor is 0,482. 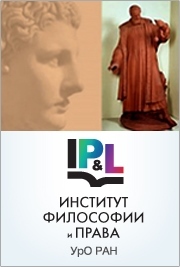 Founder of the journal is the Institute of Philosophy and Law, Urals Division of Russian Academy of Sciences. The journal has been registered in the Federal Agency on Mass Communications, Connection and Protection of Cultural Heritage. Letter of Registration ПИ №ФС77-29547 on September 14, 2007. The journal is printed four times per year. ISSN (print) 1818-0566. ISSN (online) 2312-5128. Subscription index in the Russian Post Catalogue is 43669.